Yes, I finally made it to somewhere warm and I could feel my life warming up. I loved looking up at these mountains and breathing this dry air. Wow! We did it! My best friend, Ann and I actually talked our parents into letting us go to school out of state. I have no idea how since it cost more money and I was one of 6 kids soon three of us would be in college, no scholarships on the horizon. Here I was in Tucson Arizona far away from Missouri and here we were our first week being asked to dinner at some guy’s apartment. I can’t take credit for this. He was probably 5’2” and my friend Ann was my height 5’9” and outweighed him by 50lbs. Don’t get me wrong she was beautiful and really fun but could have definitely crushed him. We went to dinner cause we were in a new environment and knew no one, oh except this other boy/man she had a huge crush on, who was the reason she got me to come here to Tucson with her. He said, “I’m a vegetarian and this was a vegetarian dinner.” I said, “What does that mean?” He explained that it meant he didn’t use any meat products. I was overjoyed. I felt that I had been let in on a quantum secret. I had never liked meat and always had to have mine charred. Deliriously I asked, “You mean you don’t have to eat meat?” He laughed and I became a vegetarian on the spot. He figured with a conversion like that he would press onward. He took me to another room and showed me that he did yoga. He practiced with a book. I loved the concept of the yoga poses but doing it from a book just didn’t grab me the way the vegetarian thing had. So we put the word out for a class, a yoga class. Had anyone heard of one? No, but we were all on alert to the possibility. This was the same semester that I was taking speech class and I needed to give a speech on something I didn’t know anything about but was interested in so I choose Yoga. At that time there were almost no books on yoga except ancient manuscripts in the library so that is where I planted myself. I gave the speech complete with poses including wrapping my legs behind my head which I didn’t think was the least bit unusual and had 12 people come up to me afterwards asking where they could do this yoga thing. I had to confess that I didn’t know but this was an expanded group to be on the look out for yoga. We all agreed to let each other know if we saw anything. This was in December now move to May and in runs a friend and says. “There’s yoga in the park wanna go?” We just jumped up and took off for the park. These were the days that nobody knew what yoga attire was nor mats you just did it and learned to bring a towel or blanket. That showed that you had been to class before. This is not important what was important is that we got really high. I really fell in love. No need to do drugs this was the real stuff, the breathing, the chanting, and the poses, all of it together. Our teacher chanted like an angel, I was transported on that piece of grass in a Tucson Arizona park I knew what yoga meant before I ever knew what the word meant. I had the experience. One class and I was hooked. My students now ask me “How often should I come.” I always laugh because we just knew the answer was every day at least once a day not how many times a week but a day. I was home. This was what I was being called to experience. The breath of fire oh my God was it great. I felt clear, happy, and high. Follow this with chanting and who wanted drugs when you had the real thing. 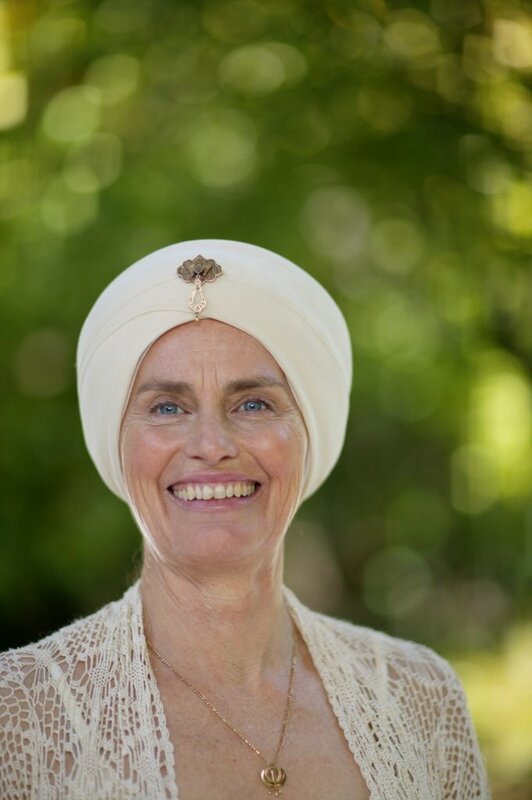 I didn’t think of teaching then but my teacher, Yogi Bhajan had us teaching early. He would say, in those days, not now, “You have had three more classes then most of the people in the class so share what you know.” You want to learn something read it you want to know something write it you want to master something teach it so teach we did soon and it was a love affair. I got it and it got me. 2 – Tell us a bit about your background. What have you done in the past that relates to the topic? Check out my bio but been doing this for 40 years. A yogic community in Canada for 17 years, I have taught everyone from Celebs will send you some names if you want to businesses to children and teen. I have done women’s retreats for years and taught all over the world. 3 – What advice would you give to someone who is interested in your topic? What you get will be so much more than you bargained for. 4 – What do you see as the benefit to participating in groups and organizations that discuss this topic? My first thought would be networking opportunities and the chance for personal or business growth. What are your reasons? That would be it. 5 – What products do you offer would help a person who is interested in this topic? DVD’s Chakra Pillows to connect heal and relax and the great flip charts which you will be getting in the next couple weeks. These must go on tour as well that is where all these exercises come from. 6 – Who is the ideal person for these products? Women looking for more and all those that are connected to them. If each person that reads this was going to recommend these products to one person, what sort of person would they want to chose? 7 – What have you found to be the biggest stumbling block for people who want to learn more about this topic? It is difficult to come by if they find us then …. I want to eliminate that stress and give it to them easy. 8 – How would you suggest they can overcome that? Go to my web site and find the product right there. 9 – What do you find is the biggest motivator to learn more about this topic? The stress in peoples lives today makes what I have imperative unless you have just had a lobotomy.